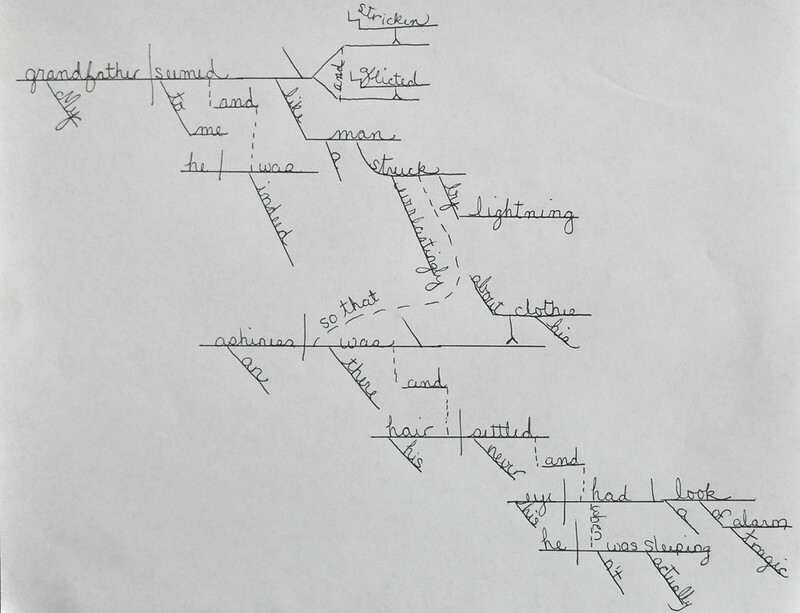 Did you try your hand at diagramming any of the sentences in my challenge? 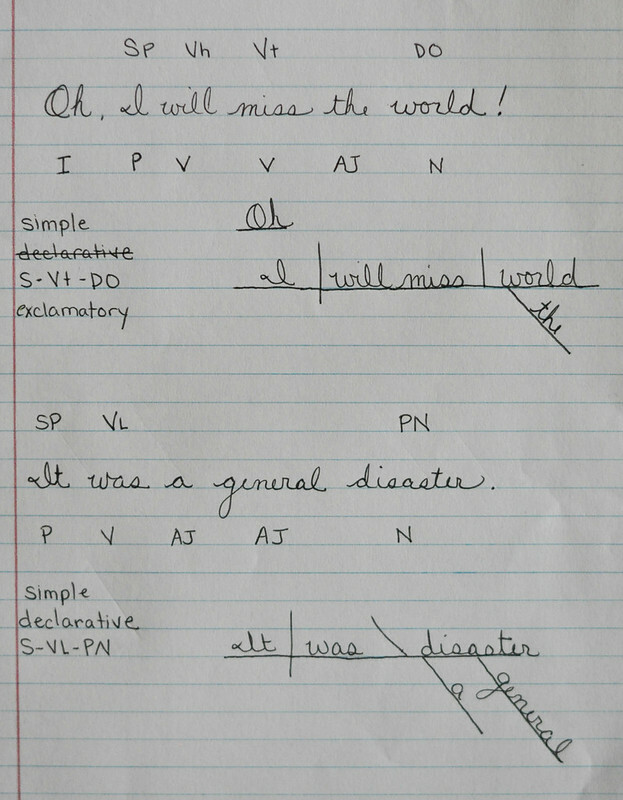 Did you get stuck, or feel comfortable with the diagrams? I’ll admit, I had to guess in a couple places!! Oh, I will miss the world! It was a general disaster. Is that what you got? 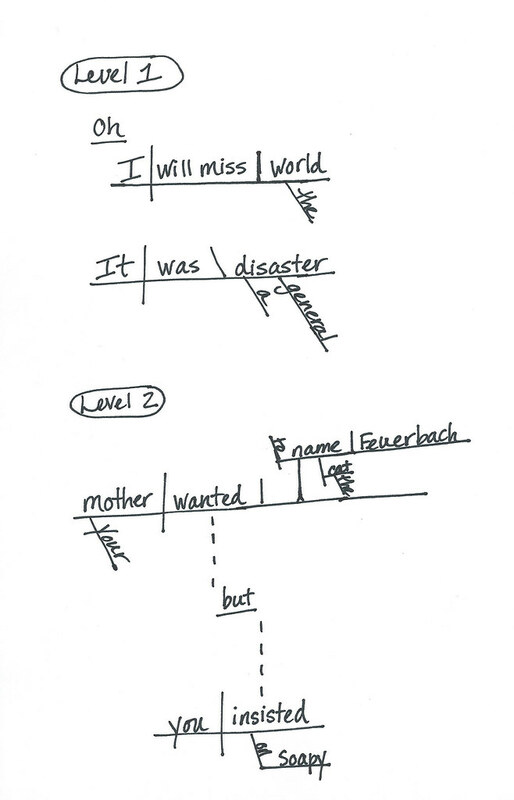 The first one is a straightforward subject (I), verb phrase (will miss), and direct object (world). 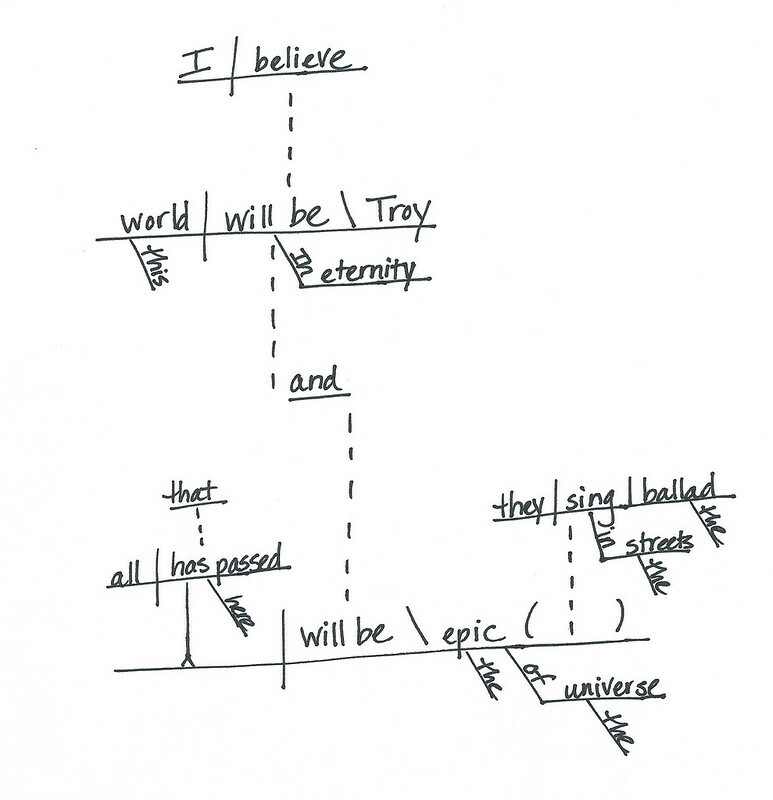 “Oh” is an interjection, which is diagrammed on a floating line above the subject, and “the” modifies “world.” Yes? The sprinkler is a magnificent invention because it exposes raindrops to sunshine. Your mother wanted to name the cat Feuerbach, but you insisted on Soapy. This habit of writing is so deep in me. Let’s talk about the tricky one first. 1. 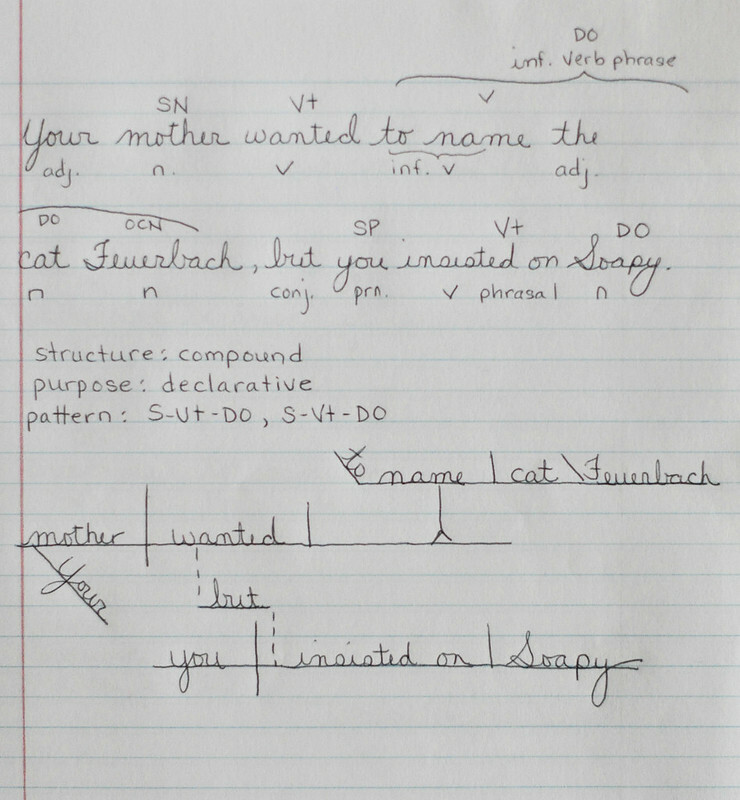 I was thinking that, in the infinitive phrase “to name the cat Feuerbach” (which is being used as a direct object), “cat” is a direct object and “Feuerbach” is an object complement noun. 2. I also decided that “insisted on” could be a phrasal verb with “Soapy” as a direct object, so that’s how I diagrammed it. But I totally could be wrong about both. Like I said, kinda tricky. 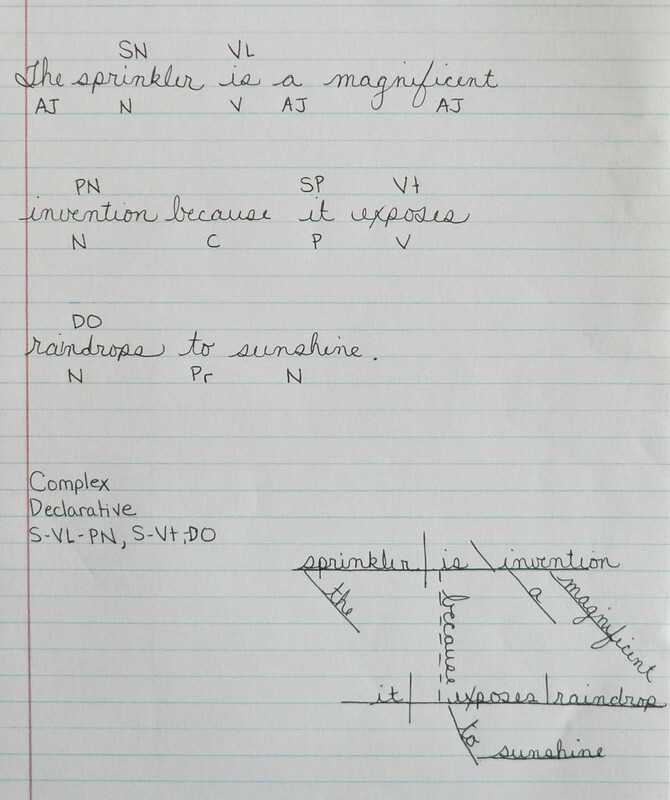 The sprinkler sentence was a little more straightforward. 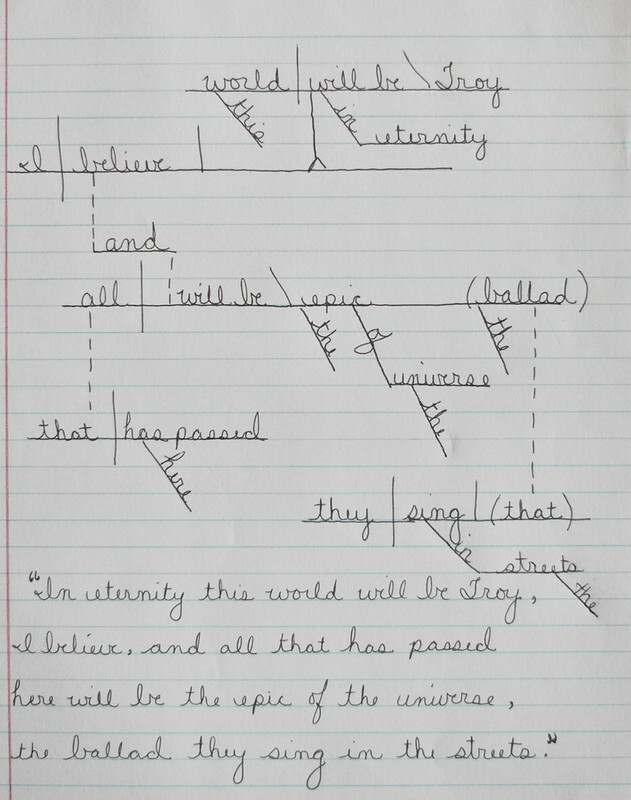 An independent clause and a dependent clause are joined by the subordinating conjunction “because.” The first clause has a linking verb with a predicate nominative that renames the subject. The second clause has verb that transfers the action to a direct object. “To sunshine” is an adverbial (modifies the verb) prepositional phrase. 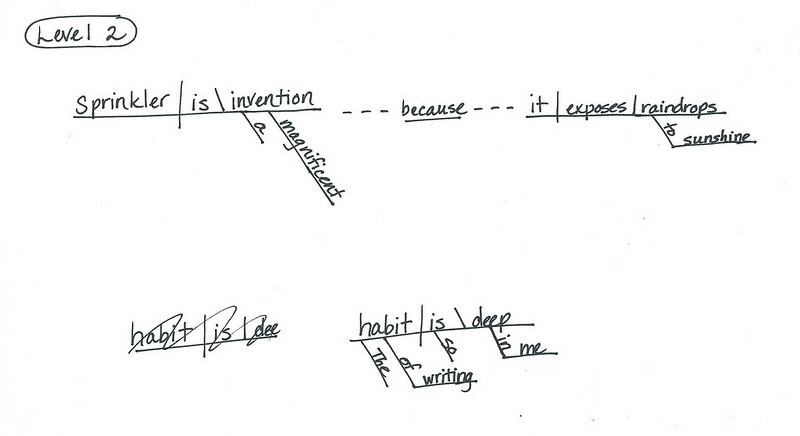 Which propels us straight into the final sentences. His mother would take tiny bites of her food and swallow as if she were swallowing live coals, stoking the fires of her dyspepsia. In eternity this world will be Troy, I believe, and all that has passed here will be the epic of the universe, the ballad they sing in the streets. My grandfather seemed to me stricken and afflicted, and indeed he was, like a man everlastingly struck by lightning, so that there was an ashiness about his clothes and his hair never settled and his eye had a look of tragic alarm when he wasn’t actually sleeping. 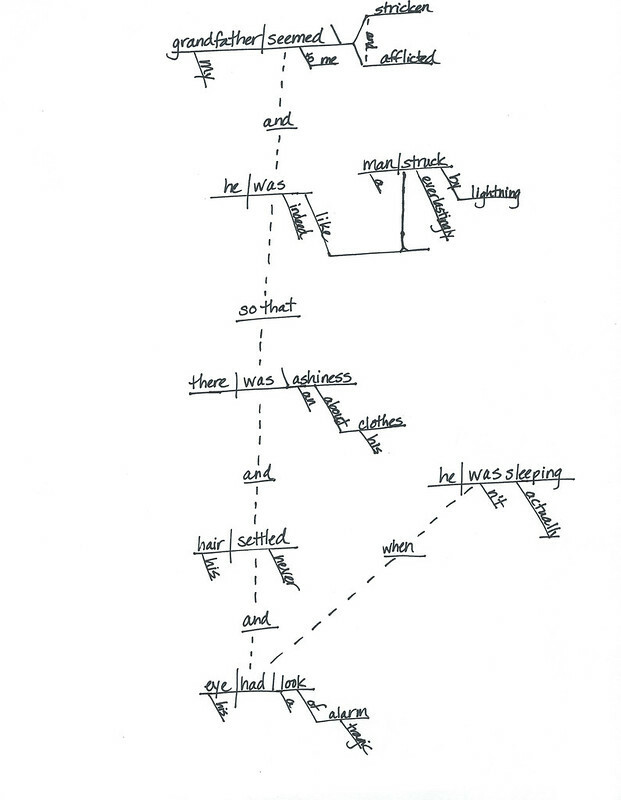 I am missing my conjunction “as if” on the dotted line above. I knew I’d forget something. 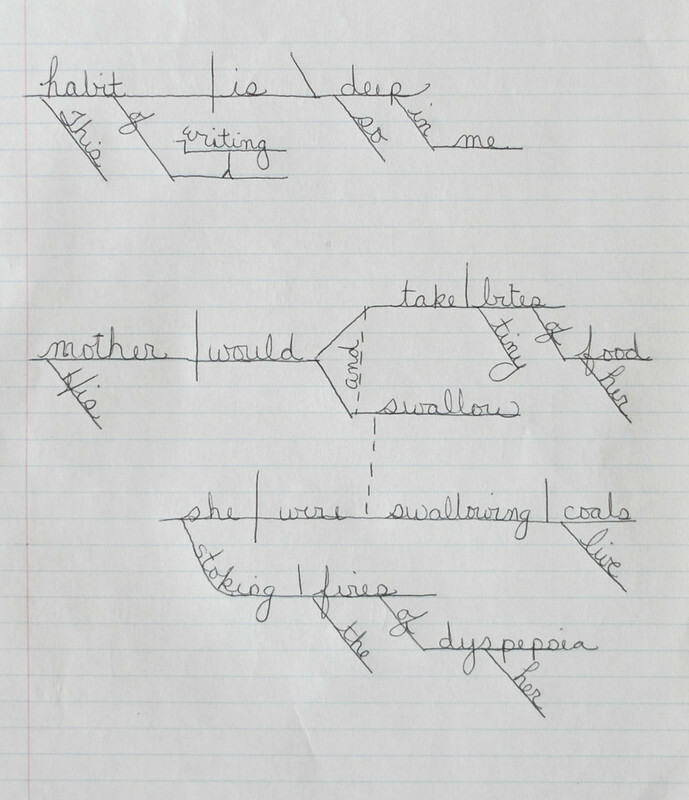 I decided to treat “stoking the fires of her dyspepsia” as a participial phrase, but it could have joined “swallowing” to make a compound predicate without the conjunction “and.” Kellie chose to diagram it as a participial phrase modifying “coals.” That could be right. Anyone want to share an opinion? This next quote is from one of my favorite paragraphs in the book. Kellie diagrammed it a bit differently. Hers could be correct. I don’t know what to say about that, except I tried. Tell me where I went wrong. Some of our differences are simply stylistic differences. 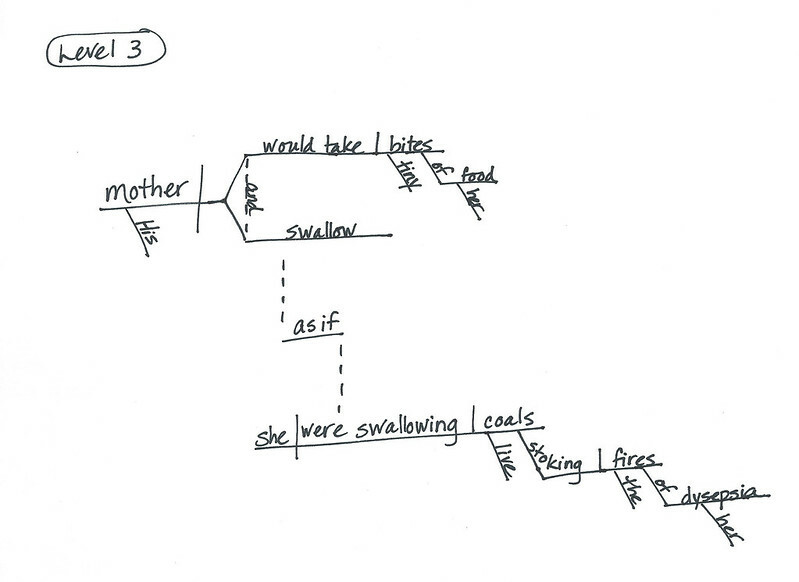 There is some accepted variety within diagrams, such as diagramming conjunctions and indirect objects. And, whew, that took me forever. No, I totally agree with you on "stoking the fires" as a participial phrase. It's funny, because my son constantly puts his prepositional phrases under the direct object when they should go under the verb (and then under the verb when they really do go under the DO). We go over this every. single. day. So how appropriate that I made the same type of mistake here, and not just in that sentence. "To sunshine" -- duh. : ) Oh, well. It's still fun! And, yes, there are definitely stylistic differences. The handbook I used in college that was published in 1961 does a lot of things differently than my son's AG manual. So I end up doing kind of a mish-mash version. This was a helpful exercise! I learned a lot by looking over your diagrams. I was never taught to diagram in public school, no not one time, so this all looks confusing to me! Kellie~ I think your treatment of "I believe" is correct. It should be separate from the main clause, as an aside. Anyone correct this sentence for me? Because I needed it urgently. It help you in all ways.